Brazil, Russia, South Africa, India and China – the leaders of all five emerging market economies met on the margins of the BRICS Summit in China to discuss their role in world affairs, energy and food security challenges, climate changes and hardening commodity prices. 2 Growing BRIC by BRIC! 3 Alleviating disputes with China! 4 Allaying fears of Nuclear disaster! 5 Wanted: Cease-fire at Libya! Furthermore, the role of dollar in global finance and commerce hit a trough, with the BRICS club of five developing nations signing an agreement to extend credit and grants in their own currencies, in a bid to overcome deficiencies of current monetary order; thus bypassing dependence on the predominant US dollar. The group of world’s fastest growing economies also called for changes to the global financial system, urging IMF to expand its use of Special Drawing Rights. At the same time, they also insisted to push open the top positions in the World Bank and IMF to reflect the changes in the world economy and representation of emerging markets. For the PM Manmohan Singh, the tour started off on a right note with China’s decision to drop its stapled visa policy for Indians belonging to J&K, just ahead of the summit. Both the countries have been on divergence with each other on visa policy for residents of so-called disputed regions and growing bilateral trade deficit issues. Allaying fears of Nuclear disaster! The recent Fukushima nuclear power plant accident in Japan had raised concerns over safety issues and feasibility of nuclear energy for the mankind. With this regard, India and Russia has agreed to review safety measures and incorporate additional features in reactor technology and related fields for their ongoing nuclear cooperation programs. Among other concerns, the five big emerging powers also expressed misgivings about turbulence in the Middle East and NATO-led air strikes in Libya, calling for an immediate cease-fire in Libya which has led to humanitarian crisis in the country and added global uncertainty. 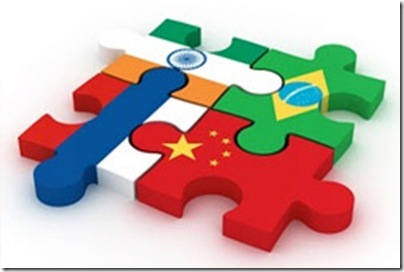 Can BRICS economies grow strength hand-to-hand from hereon? I agree with the author, I felt all the facts are written. I want to add to this one more point, if we are in the position to keep the dollar aside, we should be able to print our own currency. Is India printing thier currency by thier own? or still its getting printed by those bunch of european companies which were printing from past few decades……btw, some people even claiming that these companies are printing our currency (fake) and selling to our friends(like pakisthan) and asking them to pass this currency into our country……. @ Viral. I am sorry to say that there is nothing special about this ‘Block’ called BRICS. The reason for my detailed explanation is for outsiders, these countries are crucial. For among the four countries, there is nothing in common. We do not have common goals, we do not have common region, we donot have common political atmosphere. We can safely consider ourselves from different planets. But for fund managers, these are the nations which provide resources and basic building blocks and can not be neglected. For Fund managers investing in BRIC is bread and butter. Now coming to the internal relations, I dont see any similarity among them. I dont see any voluminous trade between any two countries (except China importing huge quantities of iron ore from India and Brazil and gas from Russia) Political relations are cold at best. We all know the problems between India-China, China, Russia. This block will achieve nothing. Its a ceremonial block just like SAARC. Compare this with NAFTA Block. Canada, US, Mexico have lot in common. Canada supplies massive quantities of coal, ferrous, non ferrous ore to US, US sets up manufacturing units in Mexico creating lakhs of jobs. Now BRIC is joined by South Africa another country with negligible trade with the above four. We know what the four countries represent (minerals, energy source, manufacturing, services) now what South Africa represent? Gold? Now they decided to trade in local currencies !! Another laughable topic is they asking West to stop hitting Gaddafi forces. The request is nothing but a formal statement to show that we too exist. They dont expect west to take serious note of the request, not they want west to actually stop hitting targets. Its just to please old friend Gaddafi. They can use a little bit of imagination. Revolution there is in such a stage that if not tomorrow after some years, regime will change. What happens if the new rulers note our siding with Gaddafi and give cold shoulder to us in trade?